In an effort to keep our clients safe and healthy, we conducted daily medical checks throughout the Kilimanjaro climb. This helps us to ensure that the trekkers are adapting to the thinner air and not developing the early symptoms that lead to altitude sickness. It also helps us to diagnose other illnesses too, allowing us to treat them before they become a problem. One of the tools that we use to determine the status of our climbers is a pulse oximeter. 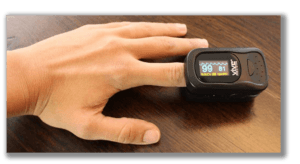 This handy gadget attaches to the end of your finger and within a matter of moments provides a reading of the current oxygen levels within your bloodstream. The device will also show your heart rate, which can beat rapidly at higher altitudes. Your heart rate and oxygen saturation are good indicators of how well you are acclimatizing to the thinner air. Recording that information also helps us to keep an eye on your overall health while on the mountain as well, giving us early tip offs if something is potentially going wrong. Generally speaking, a higher level of oxygen saturation is an indication that your body is adapting well and processing oxygen from the thinner air in an efficient manner. At sea level, most healthy individuals will have an oxygen saturation reading of 95% or higher. But on the mountain, that number is likely to decrease, particularly as we climb higher. That said, a high level of oxygen saturation isn’t necessarily a sign that someone is healthy and completely out of danger either. Our staff has been trained to keep a close eye on all trekkers and watch for early warning signs of medical issues. They also know how to address these challenges and will do everything they can to make your Kilimanjaro climb a safe and happy one. Where a climbing group has a pre-determined wish to be equipped with one of our pulse oximeters this is available at no extra cost supplementary charge of USD 0 climbing group per pulse oximeter.